Ugh, I’m so behind on blogging my bentos already! 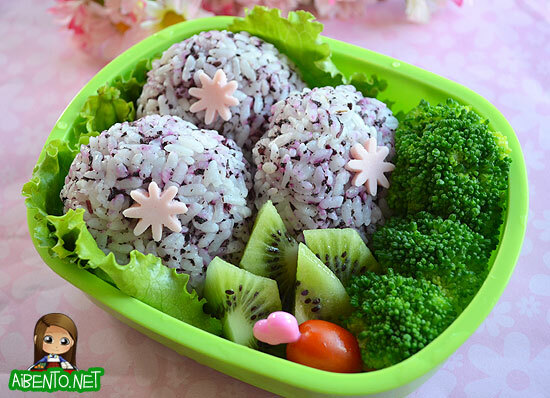 I made this one for Wednesday, going lighter without meat, but still bringing in calories with three onigiri. Using shiso furikake for onigiri is still my current favorite way to make onigiri because I love the taste of ume and the purple is so pretty. I put little cut flowers of fish sausage on top of each and then added in fresh veggies and a cut up kiwi. To cut the kiwi like that I just cut all the sides off and then quartered it. I thought it looked pretty with all the cut shapes! Here’s a closer look so you can see the onigiri. 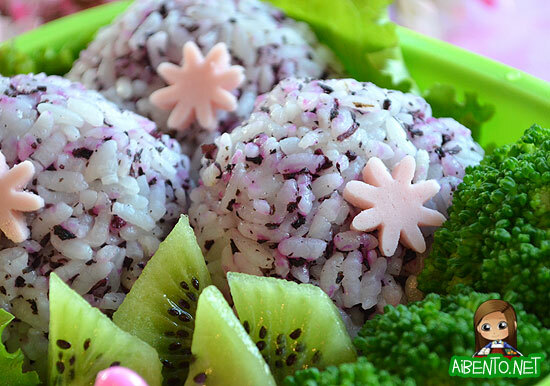 The flakes moisten up in the rice and begin to dye the grains, which gives it that pretty purple color. I took a rest day on Wednesday due to being barely able to move and was surprised how much it helped to let my muscles recover. I had my one cheat meal of the week Wednesday night when we went to eat at Kim Chee 2 and probably gained all my loss back, but hopefully I’ll end up losing at least a pound in the end.